Majestic Peru and AFCA are teaming up to take you to Machu Picchu via the Inca Trail and to stay at a lodge in the Amazon for an amazing experience. Whether it’s a lifetime dream of visiting Machu Picchu, walking the cobblestones of Cusco’s ancient streets, doing remote high Andes treks, or delighting in the wonders of the Amazon, Majestic Peru can give you an exceptional glimpse into Peru. Teams with 4 to 12 hikers will experience a journey that takes them through various climate zones and up to an elevation of over 14,000 feet in order to reach Machu Picchu. The views are breath-taking and the memories are endless and priceless. From there, you’ll experience the Amazon while viewing flora and fauna found nowhere else. Amazing! 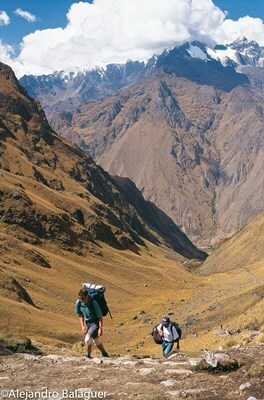 Climb Up: Peru should be on everyone’s bucket list! If none of the current dates suits your needs, please do reach out to us at info@AFCAids.org and we’ll do our best to organize a team around your preferred dates. We’ll sure do our best! Here’s some opportunities to travel to Peru while supporting the programs of AFCA’s partners in sub-Saharan Africa and having a fabulous cultural experience. If for any reason we cannot get the Inca Trail permits for the exact dates we request, Majestic Peru will do their best to get them for the day before or after the indicated date and will make the necessary changes to the itinerary to accommodate this change. To date, this has never been an issue, but the possibility exists. Complete the application and submit it by email, fax or by mail. Be sure to make your application as complete as possible and include the dates you’d like to travel to Peru. Upon submitting your application, you’ll need to pay your $500 deposit to AFCA for the application to be complete. This deposit is non-refundable. Be sure to write “Peru” on the memo line of your check. After you have made your deposit, you are officially on the team! 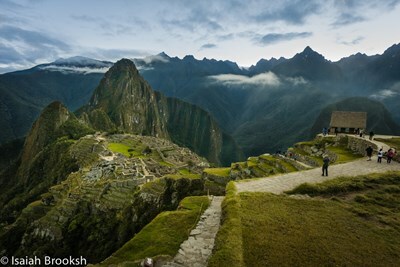 You will be climbing the Machu Picchu route. Check out your itinerary. AFCA teams fly into Cusco’s Alejandro Velasco Astete International Airport where Majestic Peru staff meets them. After loading the gear into vehicles, team members will settle into their hotel in Cusco. They will spend a day or two acclimatizing while doing some sightseeing in the city while learning about the culture and art of the area. After some days in the city, you will start your four-day hike into Machu Picchu, surrounded by spectacular views of the Andes Mountains. Upon your return to Cusco, you will spend a day further exploring this fascinating city and resting up from your hike. Next, you’ll start your trip to the Amazon jungle lodge (includes a short domestic flight – Majestic Peru will help you arrange this) where you will see fauna and flora specific to this region of the world. You’ll have the chance to visit a local farm, ride a catamaran in Lake Tres Chimbadas, and much more. Click here for details about this adventure. At the conclusion of your stay in the Amazon, you will be taken to the airport from where you will either start your trip home or you will continue on your own personal adventure. The key to staying comfortable while on an active trip is layering. To obtain maximum comfort with minimum weight, you need versatile layers that mix and match to create the right amount of insulation, ventilation and weather protection. This gear list has been created to help you choose your clothing and gear for this trip. Try to bring only what is necessary. All items on this list are optional and suggestions only and given in good faith. You must determine your own needs, but these have been suggested by those familiar with the demands of the tour and the local services and environment. You must determine what you are able & willing to carry daily while traveling throughout and while hiking if you will be doing a trek. We recommend you pack carefully and lightly so you may enjoy the tour and the experience to its fullest! During any treks you will be able to store unnecessary gear and luggage at the hotel in the start city in your main bag. 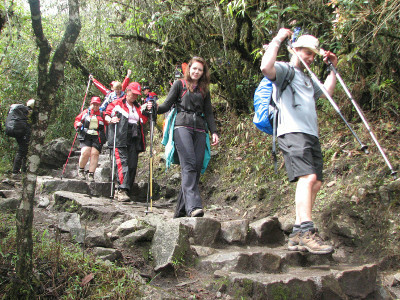 While trekking, porters or mules will carry 7kg including your sleeping bag, in a duffel bag that we will provide you. The remaining gear will be carried by you in your daypack. Pack wisely; you won’t be able to get anything from the porters/mules during the day. If you are doing a trek, you will have a pre-trek briefing either 1 or 2 days before the trek so that you can ask any last-minute packing questions then. During your home-stay, you will spend a night with a local family. This is a great opportunity to bring school supplies, colouring books, crayons or even sun-block for the children of the home-stay family. Something from home makes it even more special. Bring a photo of your family, your house, your pet, you will be surprised at how interested your host family is. USD Cash – exchange for local currency at the airport, in banks or as recommended by your local rep. It is a good idea to scan your important documents before leaving home and send them to your email address and to someone at home. This way, you always have access to a copy in the event that the original gets lost or stolen. Also, you can make a photocopy, which you put in your carryon luggage. Clothing – the number of items will depend on the length of your stay but we have to put together this list to give you an idea of what you will need. Be ready for dramatic temperature change. Pack for cold weather (close to freezing) and warm weather in sun (20-22oC), and rain. Zip lock bags – to waterproof miscellaneous items such as cameras, phones, etc. Sterilizing tablets (iodine/chlorine-based) just in case. Thank you again for committing to helping children served by the American Foundation for Children with AIDS (AFCA)! Our Payment Policies and Procedures guide applies to everybody who commits to a Climb Up Peru So Kids Can Grow Up (CUP) fundraising trip, so please read this carefully. Once you are invited to join a CUP team, you must confirm your place on the team by submitting a nonrefundable and nontransferable deposit to AFCA in the amount of $500. The balance of trip payment (trip cost minus the $500 deposit) is due no later than 90 days prior to departure. All payments toward your trip must be made in U.S. dollars to AFCA and designated to CUP program (see the “coding donations” sidebar). Payments may be submitted by personal check, money order, MasterCard, Visa, or American Express. Your trip payment covers your lodging, food, ground transportation, orientation materials, your climbing fees, and a donation to AFCA’s programs. Not covered are: costs of passports and visas; excess baggage charges; immunizations; travel insurance; international and domestic airfare (Majestic Peru will help you purchase your domestic airfare in Peru and will let you know the current price when you register) airport departure taxes; sightseeing, game drives or meals not listed in each itinerary; laundry; communication charges; and gratuities. You or your donors may submit funds by credit card via your Crowdrise fundraising page (www.crowdrise.com/climbupperu) or through the link “donate now” (www.afcaids.org) – accepts donations from internationally issued credit cards) or by telephone by calling AFCA at (888) 683-8323. Participants and donors who submit funds by credit card will receive an automatic email acknowledgment that the payment was received. Your deposit and any payments you submit toward the cost of your trip will automatically be credited toward satisfying your financial obligation only when coded as per the coding donation sidebar below. For a donation to be credited toward your trip, your name and “Peru” must be written on the memo line on all funds submitted to the AFCA office on your behalf. For online credit card payments through our website, select Climb Up program and have your name and “Peru” entered in the comment box. For personal checks or money orders – please include your name and “Peru” on the memo line. Fundraising web page – You can create a personalized fundraising web page for your trip through www.crowdrise.com/climbupperu. You can then direct potential donors to your web page where they can learn more about AFCA and your specific trip. Contact AFCA for more details. Tax deductibility – Funding raised toward the cost of a CUP trip also includes the cost of food, lodging, climbing fees and land transportation during the trip. A portion of the required trip payment supports the charitable purpose of AFCA. Depending on the participant’s country of origin, this trip’s cost may or may not be tax-deductible. Please consult a tax adviser concerning your specific situation. Acknowledging donations – All donors who contribute via check or money order payable to AFCA or who make a credit card donation designated to a CUP climber are sent acknowledgment letters by AFCA. Those who donate on line (via a personalized web page or via the link “Donate Now” on AFCA’s website) receive a prompt e-mail confirmation that the donation was received. Checks should not be made payable directly to you. Funds raised in addition to the published trip cost – One of the stated purposes of the CUP program is to raise funds for children in Africa who are impacted by the AIDS pandemic. To remain consistent with our mission, AFCA is not able to roll additional funds over to a future CUP trip. AFCA will use any additional funding that you raise towards the children we support. Fundraising for airfare – Funds raised in excess of the trip cost may not be used to cover all or part of a CUP team participant’s airfare. However, we recognize that some people may want to raise money for their airfare. Please do this on your own and not through AFCA. Participants may still be able to claim their airfare as a tax-deductible expense even if the funds are paid directly from the participant to a vendor, as long as the trip is in pursuit of a charitable purpose. Team members will need to contact a tax adviser concerning their specific situation. For all trip cancellations received more than 90 days prior to departure, the $500 deposit is forfeited, as well as the $150 deposit made on your behalf to the guide company for entry to the Inca Trail. For cancellations 45-89 days prior, the fee is 50% of the total trip price; 45 days prior or less, 100% of total trip price. Once again, we appreciate your dedication to AFCA’s mission and your willingness to participate in a Climb up Peru trip. Thank you for complying with AFCA’s Payment Policies and Procedures guidelines and please let us know if we can be of any additional help. Like all big mountain ranges, the peaks of the Andes generate and attract their own weather, making conditions impossible to predict. There are however two distinct seasons in the region, a wet season that occurs from November to March, and a dry season April through early October although as in other parts of the world this is changing and becoming a little bit less predictable. The dry season is characterized by cold nights with temperatures near freezing or slightly below in Cusco and Puno, but sunny days, with an average daytime temperature in Cusco of approximately 20°C to 22°C (68°F to 72°F). This can be considered a stable pattern, but be prepared for a wide range of temperatures, from freezing nights, to snowy and windy conditions, to bright sunshine intensified by high altitude. The wide fluctuation in temperatures makes it important to bring layers so that you are always prepared. The rainy season tends to have less diurnal temperature variation as the nights are warmer and the days not quite as hot due to the rains but when the sun does shine during this time of year the temperatures can be close to 25°C (77°F) but the sun’s intensity makes it feel much hotter. The Amazon basin is almost always warm however there are sometimes cold temperatures that sweep down from the Andes, “friajes” which can catch people off guard. During a friaje the temperatures can reach as low as 15°C (59°F) which feels very cold with the humidity and lack of infrastructure for these climates. That being said, the day-time temperature is generally between 25°C to 30°C (77°F to 86°F) at the lodges but higher in the cities as you do not benefit from the same shade protection. Although it rains through the year in the Amazon basin, there is a marked rainy season during the same season as in the highlands during which there are many more mosquitos and you should be prepared for this. 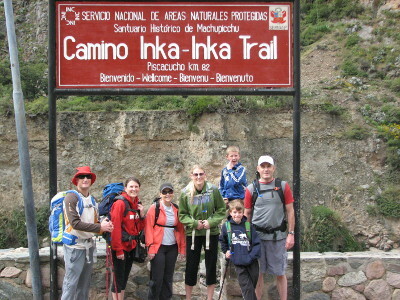 Hiking the Inca Trail is not a walk in the park. It’s also not Mt. Everest. So how do you train? First, there is no technical climbing involved when hiking the Trail. This means you do not need ropes or rock climbing skills. But, you will be hiking uphill several miles each day with decreasing levels of oxygen. This makes cardio and endurance training essential. We strongly encourage you to consult with your physician before registering for the climb. Talk you your doctor if you have any concerns, especially related to your heart, lungs and/or leg joints as this climb is physically demanding. Once your doctor clears you to climb, it’s time to begin training. There are countless ways to approach training for your climb and the American Foundation for Children with AIDS does not endorse one training over another. Instead, we encourage you to do some research and create an exercise regimen that progressively builds your stamina and your cardio strength. Here are a couple links to get your research started. Hike often wearing the boots you will wear for your climb and progressively increase the length of your hikes. Include as much elevation as possible. Hike wearing your day pack and build up to hiking with 20-25 lbs in your pack. Each climber must raise a minimum of $6,000 (air fare is NOT included) in order to participate in this event. This cost covers transportation from Cusco’s Alejandro Velasco Astete International Airport to base camp; lodging; food while on the event; guides (not tips); water; snacks; Inca Trail entrance fees, and a $4,000 donation to AFCA’s work in Sub-Saharan Africa. Not included are: air fare (international and local), passport, visas, vaccinations, alcoholic beverages, tips, laundry, and souvenirs. Fundraising can be a bit daunting, but you shouldn’t let that stop you from being part of Climb Up: Peru. We are here to help you with brainstorming and to answer any questions you have. Please contact us at tweaver@AFCAids.org with questions but also check out our fundraising tips. Maybe one or two of them will help you get on your way to your fundraising goal. Download the sample letter, pledge form, and press release or create your own. Personalize it…make it exciting by printing it on brightly colored paper. If you’d like to create an online fundraising page, go to AFCA’s Crowdrise fundraising page where you can create a personalized fundraising web page for your trip. You can then direct potential donors to your web page where they can learn more about AFCA and your specific trip. This is a GREAT way to get the word out! This is a GREAT way to get the word out! Please note: Funds raised toward the cost of a Peru climb cover guiding fees, food, lodging, park fees, and in-country transportation during the trip. Only a portion of your payment supports the charitable purpose of AFCA’s programs. Depending on your country of origin, the trip’s cost may or may not be tax-deductible. Please consult a tax adviser concerning your specific situation. Majestic Peru was founded by travel industry professionals with a combined 30 years experience. With a profound love of Peru, and its people, they understand both what it is like to be a visitor, and have unique ‘insider’ insights that come from living long term in the Andes. They delight in revealing the soul of Peru, and your tour will delve beneath the surface so you can explore the tastes, sounds and experiences that make this such a unique destination. Whether it’s a lifetime dream of visiting Machu Picchu, walking the cobblestones of Cusco’s ancient streets, doing remote high Andes treks, or delighting in fresh ceviche in Lima, Majestic Peru can give you an exceptional glimpse into Peru. Memories are made not just of spectacular sights- that’s why we give and receive in unique cultural exchanges such as spending time with a local family. Majestic Peru know how to enjoy the profound silences of the Andes, while at others times enjoy the delicate sounds of a Peruvian panpipes or joining in the encompassing beats of an Andean fiesta. Our love for Peru, means we can create outstanding trips that take you into the heart of Peru. 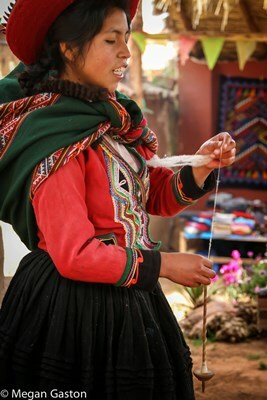 Learn weaving from an indigenous weaver, make delicious chocolate, and especially get off the beaten track in the Andes. All done in your unique style!